The Oldroyd Cardinal Range of are all handmade instruments custom made to meet the individual requirements of brass players. With a consultation with Geneva’s head designer you could have your instrument built to your personal specification. The Oldroyd Cardinal products are also available with elegant hand engraving and luxury instrument finishes. OLDROYD CARDINAL Bb Cornet, 3 stainless steel piston valves, bore 11.79 (.464"), bell 125" (4.9") red brass bell with nickel silver fused flare, red brass lead-pipe, red brass slide bows, OLDROYD CARDINAL de-luxe hand engraving, 2 triggers, one main tuning slide and one 3rd slide trigger with mini ball release, 2 water keys, black nickel highlights on removables, lacquered. 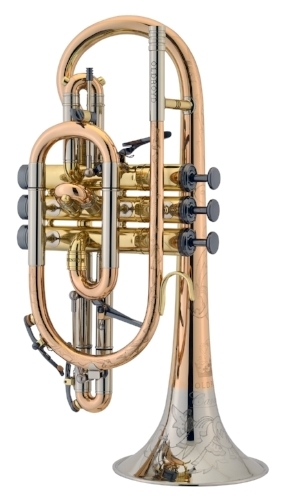 OLDROYD CARDINAL Bb Flugel Horn, 3 stainless steel piston valves, bore 11.1mm (0.437"), bell 160mm (6.3") red brass bell with nickel silver fused flare, nickel silver lead-pipe, red brass slide bows, OLDROYD CARDINAL de-luxe hand engraving, 2 triggers one 1st valve and one 3rd valve with mini ball release, 3 water keys, black nickel highlights on removable, lacquered. OLDROYD CARDINAL Eb Tenor Horn, 3 stainless steel valves, bore 11.79mm (.464"), bell 205mm (8.1") nickel silver bell, red brass lead-pipe, red brass slide bows, OLDROYD CARDINAL de-luxe hand engraving, one trigger on fine tuning back slide with teflon slide mechanism, black nickel highlights on removeables, 4 water keys, lacquered. 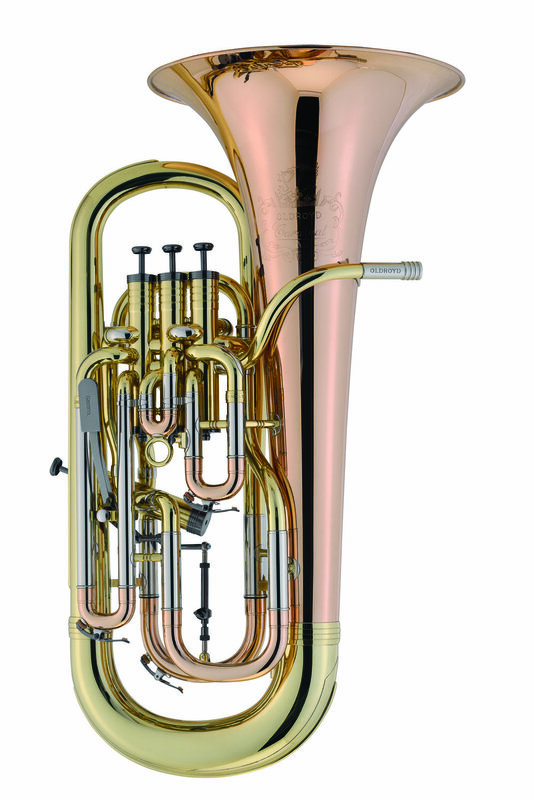 OLDROYD CARDINAL Bb Euphonium, 4 stainless steel valves, compensating, duel bore 14.7mm - 16.6mm, bell 305mm (12"), red brass bell and yellow brass lead-pipe, OLDROYD CARDINAL de-luxe hand engraving, one trigger on main tuning, 4 water keys, lacquered.